The finished interior of the Cross Insurance Center is shown Tuesday, June 4, 2013. BANGOR, Maine — University of Maine athletic director Steve Abbott said Wednesday that “over half” of the University of Maine’s men’s and women’s basketball games will be played at the new Cross Insurance Center this coming season. The rest will be played on the Orono campus at Alfond Arena and Memorial Gymnasium. 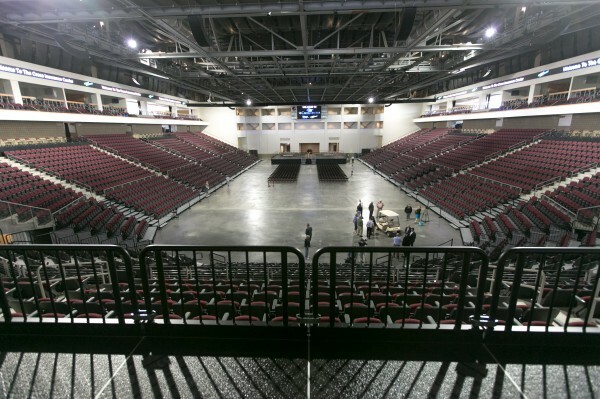 Abbott said the primary reason all the basketball games won’t be played at the $65 million, 5,800-seat Cross Insurance Center is because the Bangor facility is hosting several other events. “And it wouldn’t make sense to play exhibition games or scrimmage games down there,” he said. The men’s and women’s basketball schedules haven’t been released yet. Last season, the men’s team had 12 regular-season home games and the women’s team had 10. “… We will have far more practice time at the Cross Insurance Center than we did at Alfond Arena. They have been very accommodating,” said Abbott, referring to the fact the Black Bear men’s and women’s hockey teams have top priority at the Alfond Arena. They played virtually all of their home games at Alfond Arena but practiced at the Memorial Gym. Since many of the events held at the Cross Insurance Center will be at night, that would allow for morning and afternoon practice times. Abbott said he met with representatives from Global Spectrum, the company that manages the facility, and they reached a verbal agreement last summer. He expects a formal announcement to be made this fall. “Things are progressing well. We just have some operational details to work out,” said Abbott, who noted that it will be a multiyear deal, probably a five-year arrangement. The university will rent the facility and will be able to retain revenue from the ticket sales. Abbott said he is very happy about the pending arrangement. “I look forward to being able to showcase this great facility. And it will be a huge boost for our basketball teams. Bangor has had a resurgence the past six or seven years and sports is a small but significant part of the story. We’re very pleased to be a part of Bangor’s great comeback,” said Abbott. The Cross Insurance Center will have a grand opening gala on Sept. 10.